Your CRM system must benefit the sales force - from reps to sales management. The automation of many time-consuming tasks such as report preparation, information requests, territory reviews, proposal writing, and forecasts will save the sales rep a tremendous amount of time. A portion of this freed up time will be used to generate more sales and this time will directly increase revenue for the corporation. With sales reps actively using the CRM system, we have helped clients eliminate the tedious and often inaccurate task of creating call reports. Now their activity reports are dynamically accessible by sales management. Recently we created a sales management report that shows the number of new accounts created, number new opportunities created, number of sales opportunities closed and dollar value per each sales rep that can be run for any given date range. The non-selling tasks that a manager is responsible for take up a significant portion of each working day. Saleslogix’s funnel management, forecasting and reporting tools will allow the sales managers to spend more of their time helping close deals or providing valuable guidance to their sales reps. The result will be a direct increase in revenue from more efficient sales management. With better funnel management, the entire sales organization will be more informed about what stage a particular customer is within the sales cycle. This vision will enable the sales organization to provide the necessary next steps to keep the deal moving in the right direction. With fewer delays between each of the typical sales cycle steps, a deal will close in a shorter elapsed time frame. This reduced time will allow the sales organization to pursue other deals and in the process increase revenues. 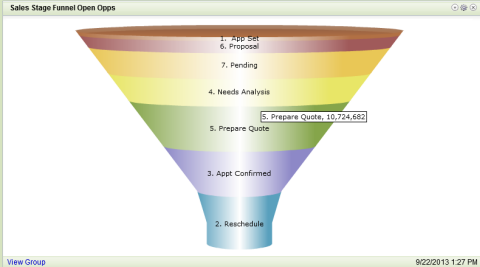 Use Infor CRM (Saleslogix) sales management dashboard and obtain quick view of the opportunity stage funnel. Click on view group link to view performance details. By automating training and territory management, SalesLogix’s solution will decrease the time necessary to train a new sales representative. The new rep will be able to start selling the territory faster, thus increasing the revenue that the rep generates in the first year. Similarly, the automation of the training should reduce the overall cost of training a new rep; therefore decreasing the sales organization’s overall training expenses. Our clients will use Saleslogix territory alignment to quickly move accounts from one sales rep to another which carrys forward knowledge of the account and contact relationships for the new hire. Templates for communicating with prospects and customers can be quickly updated and with Swiftpage e-marketing integration, the new sales rep can immediatly connect and continue business relationship development. By providing better product information, lead management, sales support and reporting capabilities, the SalesLogix solution will enhance the sales representative’s ability to sell effectively, and therefore, reduce sales rep turnover rates. This reduction in turnover has a direct bottom line savings in the form of reduced costs. By having to hire less sales reps per year, the sales organization incurs less direct costs and does not lose sales that used to result from inefficient territory turnover. Increased sales rep engagement comes from easy mobility access with their smart phone or tablet. They can lookup key contact information, update opportunity progress notes and check on customer service issues. 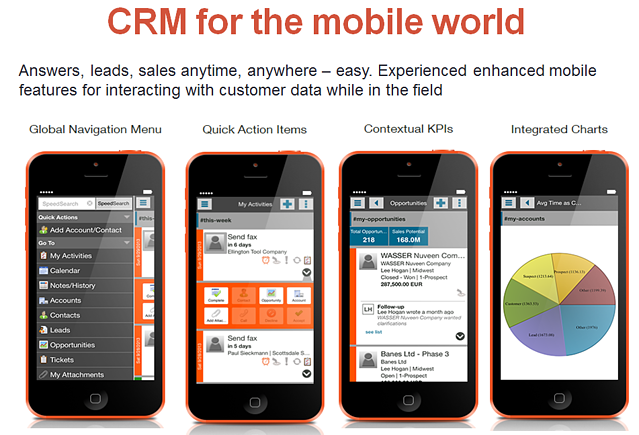 The industry-leading Infor CRM mobile platform increases user adoption, the holy grail for CRM effectiveness. Our clients will select Infor CRM for these types of sales improvement benefits. Additionally Saleslogix provides flexibility to meet your business unique needs and provides the ability to support your changing business needs overtime. Is your CRM system automating your sales force at the level it can and should be?